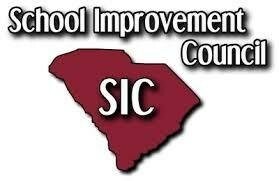 The School Improvement Council (SIC) serves as an advisory committee to a school's principal and faculty. The SIC plays a key role in the education of our state's children, brining together parents, educators and community stakeholders to work collectively to improve their local schools. This council works with the school to develop and implement a five-year school improvement plan. They then monitor and evaluate success in reading the plan's goals and objectives. Once they have evaluated their success the SIC writes an annual report to parents about the progress of the plan. They also advise the school on the use of incentive awards and provide assistance as requested by the principal.